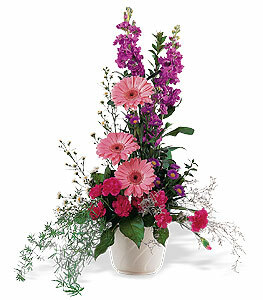 This linear arrangement with its pink and purple flowers reaches out to gently comfort those you care so much about. One arrangement with lavender stock, pink gerberas and miniature carnations, and purple Monte Cassino asters is delivered in a simple container. Page loaded in 0.6115 seconds.